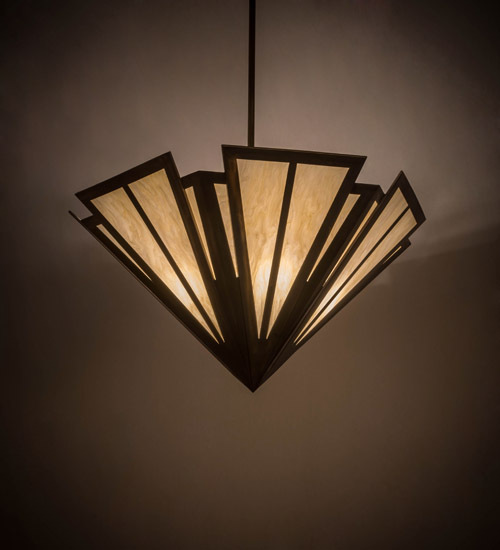 Description: Like the famed deco designs showcased in Hollywood theaters, Brum transforms Creme Carrare Idalight into a cool abstract lighting design. Striking art glass defines an extraordinary V shaped pendant which is complemented with decorative accents, frame and hardware featured in an Antique Copper finish. This Grand styled pendant is ideal for nearly any interior in fine homes, resorts, hotels and restaurants. Custom crafted by highly skilled artisans in the USA, this fixture is available in custom designs, sizes and colors, as well as dimmable energy efficient lamping options such as LED. The fixture is UL and cUL listed for damp and dry locations.